This article is about the Mushroom Kingdom II stage. For other locations named the Mushroom Kingdom, see Mushroom Kingdom (disambiguation). Mushroom Kingdom II in Super Smash Bros. Melee. Mushroom Kingdom II in Super Smash Bros. Ultimate. Mushroom Kingdom II is the second Mushroom Kingdom stage in Super Smash Bros. Melee and a returning stage in Super Smash Bros. Ultimate. In Super Smash Bros. Melee, it can be unlocked by collecting the Birdo trophy, while it is available from the start in Super Smash Bros. Ultimate. Despite the name, this stage is actually in Subcon, from Super Mario Bros. 2. The stage has a platform in the middle, and two on the side. A waterfall forms huge gorges that separate the three. Occasionally, logs will fall down the waterfall, creating temporary platforms. A Pidgit will occasionally fly in (with its magic carpet making another platform) and a pink Birdo also appears occasionally, spitting Birdo Eggs (which can be grabbed and thrown) at the fighters. Cherries, grass tufts, Semi-Solid Platforms, and jars appear in the background of the stage. 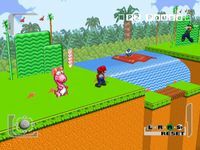 The whole level has Super Mario All-Stars graphics (though only the ground, logs, and magic carpet are in 3D); these graphics are overhauled for Super Smash Bros. Ultimate, and now use the actual graphics from the aforementioned game, albeit in much less saturated colors. Birdo also now makes the same sound effects it did in Super Mario All-Stars. In Super Smash Bros. Melee, Luigi's unlock match takes place here. The official strategy guide only mentions that the Birdo trophy is required to unlock the stage, even though the Pidgit trophy can also be collected to unlock the stage before collecting the Birdo trophy. Although the stage is Super Mario All-Stars-themed, the NES overworld music plays instead; the boss theme plays when the timer runs low in timed matches. Much like with the sped-up music in Mushroom Kingdom, the boss music will play during a Sudden Death match and on Super Sudden Death. This page was last edited on March 12, 2019, at 15:07.